In a busy year where some seriously talented and influential artists are hitting the road, Adlib will be audio supplier for The Script’s new "No Sound Without Silence" world tour, which has kicked off in the UK and Europe. Paul 'Mini' Moore manning the monitors. It’s the fourth album campaign on which the Liverpool-based company has worked with the popular Irish rock band, alongside production manager Bob O’Brien and tour manager Quinner, supplying another audio system and an A-Team crew to work with engineers Richy Nicholson (FOH) and Paul ‘Mini’ Moore on monitors. Adlib’s crew is led by crew chief Marc Peers who is also coordinating Monitor World, with Tony Szabo KSE as the systems engineer, charged with the dextrous task of fine tuning a perfect system every day, whatever the venue or surroundings, delivering continuity and sonic confidence to Richy’s rich animated mix. They are joined by Adlib’s Michael Flaherty and Simon Lawson. The system is L-ACOUSTICS, with main hangs of 14 x K1 speakers per side with 4 KARA-downs, with 8 x K1SB subs flown directly upstage to give that rock-solid studio monitor. These are augmented with side hangs of 12 x K2 per side with upstage hangs of 9 x KARA per side. On the ground, full advantage is taken of the curved stage front to facilitate a sub-bass configuration comprised of 19 x SB28s, which ensures that even sub-low rumble is distributed throughout the venue. Two stacks of three SB28s running in cardioid mode are positioned on either side at the front of the curved stage center. Approximately four meters offstage from these - along the front of the stage - are another two stacks per side of three-high SB28s running in standard mode. The 19th sub cabinet is positioned dead center under the stage, pointing backwards to reduce the rattling of the folding stage system. Strapped on top of the far offstage sub stacks are two KARA outfills and on top of the onstage sub stacks are four ARCS2 speakers to provide additional fill. Clamped right to the center of the stage itself are a further two KARA for center fill. Beneath the B stage – which is 10 feet high and located behind the FOH position – speakers are hidden under the stage to fill an "audio void" for the parts of the show when the space around the B stage gets filled up with fans wanting to get up close to the band. The system is powered throughout by L-ACOUSTICS LA8 amps running AES, with a standard Adlib Lake rack for system processing, running Dante over fiber. 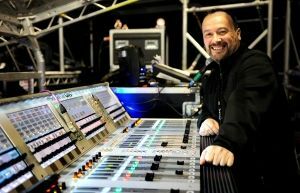 Richy’s console of choice for this tour is the DiGiCo SD7. He started using it when they opened for OneRepublic in the U.S. at the beginning of the year, after which it was added to his spec. Adlib is supplying an SD11 that was originally for the opening act, but is now for backup as the openers are also using his SD7. All the inputs are run via a DiGiCo SD rack and two additional 16 channel DiGiCo SD-Nano racks – the latter handles all the B stage inputs. An Apogee Big Ben clocks the DiGiCo Optocore system and Lake systems, everything running on Dante and the L-Acoustic LA8 amps, all of which are synchronised and running at 96 kHz. Some of the audio and visual production "jigsaw puzzle pieces" coming together during The Script's performance. One of the biggest challenges is the fact that all the technical elements – rigging, stage, set, lighting, video, and audio – making up this ambitious and highly visual production fit together like a giant jigsaw. All parts of the production are constructed or wired up in other parts of the venue and then guided into the rolling-riser based stage master plan according to key timeslots when they are ready to be physically moved into place. To ensure that all their get-in time is efficiently utilized, Adlib’s crew has devised ways to ensure its get-in work flows continuously, even while it might waiting for a slot e.g. the monitors are all cabled up on the arena floor and then rolled into position, with the set pieces all ready to go in behind. Marc Peers – working on this third Script tour - commented that most of the crew has been with the band for a long time, so it’s like reuniting with familiar friends again. Mini uses a Soundcraft Vi6 console & Sennheiser 2000 series microphones. The band has its own Sennheiser IEM systems for this tour, which are “Great, reliable and by far the best radio systems currently available,” according to Marc. There are eight IEM mixes for the band, drummer Glen Power has an Adlib MP4 sub behind him, and there are four L-Acoustic SB28s dotted along the back of stage for atmosphere and air movement. Mini is utilizing all the Vi6s on-board effects and dynamics, so his side-stage footprint is extremely expedient, with just the console and a rack of IEMs. Marc and Tony both commented that everyone on the tour – band and crew - are “top notch” and great to work with. They are looking forward to a busy summer with lots of fabulous show-stopping performances ahead. The team behind The Script's tour gathered around some of its audio equipment.